Law school applications are down. Way down. Back in 2010, everyone was lined up to get in. Now, the lines are half empty. Does this mean you should take your business elsewhere too? Maybe. But, if you are determined to go still, here’s how to take advantage of the applications drop. Law schools are frankly desperate to get you to come. I realize desperation in potential partners is unattractive. Humans interpret desperation as a signal that you can probably do better. However, we aren’t quite talking about selecting a mate for life here. You are looking for a law school that is going to find you job, one that you don’t have to pay too much to attend. Settling for the desperate suitors might be your best option. Here, we try to help you figure out which desperate law schools might be a good bet, and which ones you should probably shun. First, let’s take brief look at the history of the recent applications drop. This will give you a better idea how you can work this situation to your advantage. The far right end of each line represents the total volume of applications for law school when all the numbers were in. 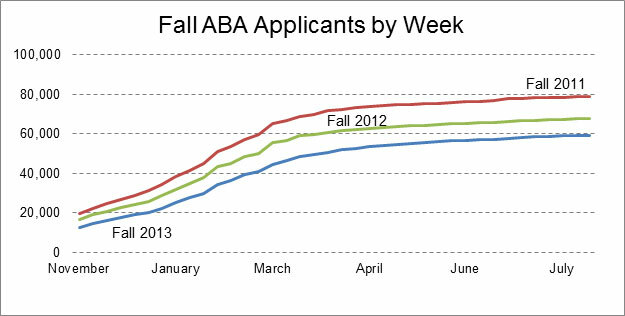 78,800 would-be law students applied to start in Fall 2011. Two years later, only 59,426 applicants showed up, capping off a nearly 25% decline in two years. That’s not even the full extent of the carnage: overall, applications to law school are down over 40% from 2004 highs. You can probably lay most of the blame for this drop squarely on law schools. They are charging the same base price for tuition that they were before the legal economy took a big hit. Not surprisingly, fewer people are applying. Click on the little circles to see different years. As you click through, you can see the yellow enrollment bar doesn’t drop much. In 2009 they got 51,600 applicants to enroll at law school. In 2012, the most recent year for which we have enrollment figures, it’s still pretty high, at 44,500. Fewer Applicants + Steady Enrollment = Lower Admissions Standards? You might ask, how on earth are they doing this? Shouldn’t they be losing a ton of students? The top 100 schools at least have done pretty well getting enough students to fill seats. A lot of schools, too many probably, are getting it done by slashing admissions standards, sometimes drastically. For now, just bracket that off in your head as the bad kind of desperate. Every school has had to lower admissions standards a bit. That’s just the reality of drawing from smaller applicant pool. However, you should be wary of schools that have really let themselves go. 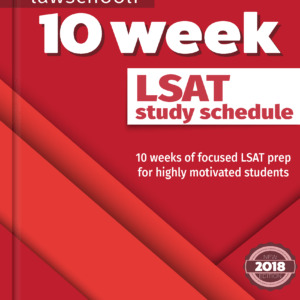 If a school’s LSAT medians have dropped substantially from 2009-2010 (like 5 or more points), this can indicate that the school is heading for trouble. At the very least they are risking a big slide in the rankings. That’s not merely theoretical either: some schools are already taking this slide, big time. 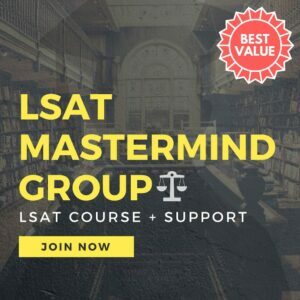 Severely dropping LSAT/GPA medians likely mean the school is trying to stay large in order to maintain big profits. I don’t know about you, but I would have zero time for a school that is trying to live like it’s still 2004. These are lean times. They should do what responsible schools are doing: cutting down on the amount of students they take. Trimming class size allows a school to keep student quality up and maintain the program’s value. Fewer Applicants + Steady Enrollment = More Scholarship Money? Staying big and slashing admissions standards is the bad kind of desperate. So what is the good kind of desperate? Plying you with cash. Schools that can afford it are spending a ton right now scholarships to attract high quality students. For the 2008-09 school year, schools spent $816 million on scholarships. That budget swelled to over $1 billion for the 2011-12 year and is likely higher now. (source: WSJ) So, while most schools are not actually lowering their price tag, they are offering deep discounts to students on a case by case basis. 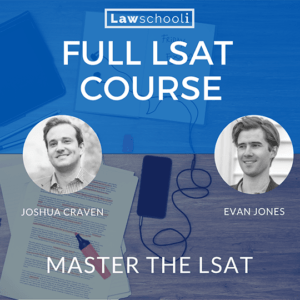 Everyone agrees that overall law school is too expensive right now. It doesn’t, however, have to be too expensive for you. The best way to take advantage of the applications drought is to put yourself in position to get a big scholarship. So how do you do that? While there is more scholarship money on the table now than ever, there’s a big caveat: by and large, the money is going to applicants with high numbers. Schools want students who raise or at least help them maintain their median LSAT and GPA. Your GPA is often a settled matter. If it’s good, then great. However, all is not lost. 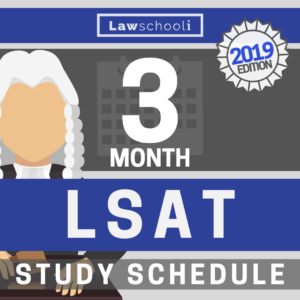 Like it or not, LSAT matters a lot more than GPA. 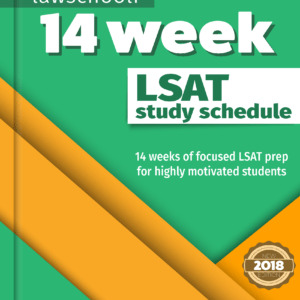 Start preparing for the LSAT, get your score up to or above a school’s median and you are in a terrific spot to draw big money. Researching the exact numbers it might take you to get a good offer is easy: Take a look at class profile for the most recent years and you can see where you stand compared the recently admitted class. Look at Duke Law’s most recent class profile as an example. You want one or both numbers very close to or above these current medians, so for Duke, you want at least a 169 or better. Pair that with a GPA over 3.75 and you are in even better shape. They’ll be shooting to improve or at least maintain those median numbers when they assemble next year’s class. Help them do it and you stand a better chance to get a scholarship. The big issue is that, right now, not every school is willing or able to cough up extra cash. It might take a little creative googling on your part, but generally you can find out via the news whether a school has beefed up on scholarships. Generally, schools with bigger endowments have been outperforming the rest. The T14 schools especially have been spending like crazy, and these schools are potentially a better value for you compared with several years ago. Yes, this spending has kept the numbers up at these schools and, as a result, they are still very hard to get into. However, they are going to make it extra worth your while if you can make yourself a competitive applicant. Outside the T14, spending on scholarships is going to vary greatly by school: some places might be a gold mine, while others are depleted. You can do your research, but one sure way to find out who’s being generous is to apply to a broad range of schools and see what offers they come up with. That’s always been a good idea, but it’s paramount now that schools differ so widely in their ability to offer you big money. Basically, watch out for ‘bad desperate.’ You CAN do better. Instead, study hard for the LSAT, get that great LSAT score and wait for the schools with cash to flock you. Don’t feel bad for taking advantage of desperate law schools. They want you. You want money. They have money. Go take it. The many forums on transferring law schools do not address my question. I am in the top 3% (rank #4) at my tier 4 law school. In the same city there is a tier 2 law school that I am applying to since I have a good internship with the Department of Justice lined up in upcoming fall in the same city as my current school. Would it be better to apply elsewhere to tier 1 law school’s and if accepted, attend the tier 1 school and give up the DOJ internship and acceptance to the tier 2 school in town? I do not want to make an unfavorable decision. I did well first semester(top 2percent), part-time student in a law school not in the top 100 – I am hoping to transfer. full-time, and to a school far better than what I could have gotten into because of low lsats & less than stellar grades early in college. Any advice regarding how high I should aim for a reasonable chance of transfer? for e.g. , should I stick to bottom 50, or shoot much higher? I am also assuming I am better off, career-wise, in a much better school, even assuming I will not do nearly as well there. I would really appreciate any advice you could give me. Transfer success is really really hard to predict. Considering the trends discussed above, I would think it’s a little easier to transfer to much higher schools right now than in previous years, but I don’t know exactly how it’s going to turn out for you. I think it definitely matters how far out of the top 100 we are talking here. Are you T3 or T4? Top 2% is very good, however. I’ve seen people transfer to t-14s from T3 schools with that class-rank. Those were full-timers, however. Is that class rank just measuring you against the rest of the part-timers? That might make a difference. You may wish to contact schools directly to gauge interest. I would think you’ll have a shot at top 50 schools, so definitely ask some of them what they think. You don’t have to be shy about it. Also note that your school may be willing to give you more money to stay, so you have to weigh that against your other choices. Do the research on the schools you are considering. Your employment prospects are going to be about as good as the average at the school that you are transferring to. It might not make sense to transfer unless you can get into a school that provides substantially better opportunities than your current one. That’s especially true if you are paying full price at the new school, which transfers usually have to do. is there any info/ advice re: transfer after first year?? Well, historically transferring meant that you had to pay full price at your new school, so what I will say is you better be damn sure that your new school is offering you good enough job prospects to justify doing that. I have never really seen much sense in transferring unless it’s to a T14. However, now I hear that some schools are willing to provide scholarship assistance to transfers some of the time. No harm in applying to see if that happens. If your grades are good enough to transfer somewhere higher, always see if your school is willing to cough up more money to get you to stay. Weigh whatever they give you in your decision whether to stay or go. Note if you are a 0L, never plan on being able to transfer. If you plan to “work really hard and transfer out” then guess what: everyone else is trying to do that too. It’s never something you can count on. The odds are that you’ll be about an average student, in which case your transferring prospects aren’t that good. If you aren’t happy with the job prospects that your first school can offer, it’s better not to go.